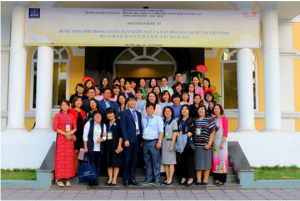 The Conference attracted 80 representatives from different education institutions in Vietnam, Korea, and others with various fantastic papers presented. 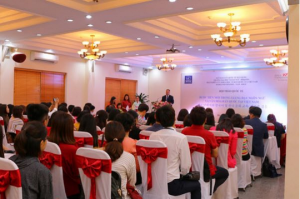 The Conference was attended by ULIS’s President Do Tuan Minh, Vice President Lam Quang Dong, representatives of ULIS’s units, post graduate students, and other students. Also, Mr. 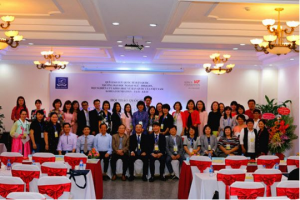 Woo Hyoung Min, Korea Foundation’s representative director in Vietnam; Prof. Dr. Mai Ngoc Chu, President of Korean science research Association in Vietnam; Prof. Dr. 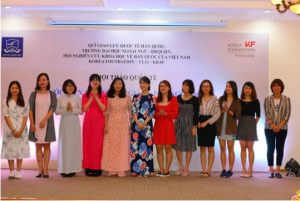 Le Quang Thiem, President of Vietnam Language studies Association; representatives from foreign and local universities; and many others participated in the event. 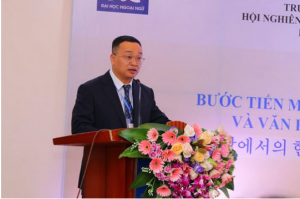 Delivering his speech at the event, President Do Tuan Minh said: “There are roughly 25 education institutions in Vietnam delivering Korean language course. Amongst these universities, ULIS has been delivering course in Korean language and culture for 24 years now. The University is privileged and proud to be one of the pioneers to launch the first Master course on Korean language and culture course. 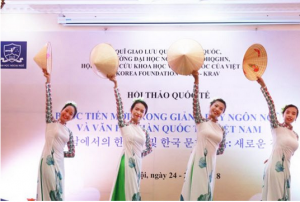 This event means that the University has established an educational system of Korean language and culture from high school to graduate levels. Roughly, there are – over 1500 students participating in Korean language and culture courses at different levels in ULIS. Mr. 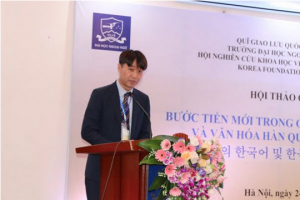 Woo Hyoung Min expressed his joy and delight to see that the cooperation relationship between Korea and Vietnam had been broadening in many aspects. 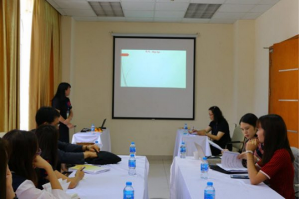 He appreciated the role of ULIS’s teachers on promoting Korean language and culture in Vietnam and hoped that the event would go well with a lot of knowledge, research, and perspectives being shared and exchanged. What was reported at the Conference? 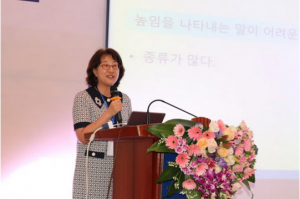 As the main speaker of the Conference, Prof. Lee Hai Young from Ehwa University delivered her paper on “receive-achieve-language-use research and its methodology”. The paper points out that using and understanding Korean properly and appropriately is not easy for non-native learners. There were also other 3 foreign professors reporting at the Conference, namely: Prof. Han Young Gyun from Yonsei University with a report on “the rule of using proper Korean words, the education of Chinese words and Chinese – Korean words”; Prof. Lee Jeong Hee from KyungHee University with a report on “the direction of developing tools to assess academic Korean proficiency of certain learners”; and Prof. Supaporn Boonrung from ChulalonkornUniversity on a report on “Facts of Korean language education amongst Thai universities”. 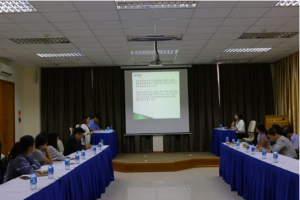 The scholars and researchers were then instructed to join in a parallel session with three different panels discussing three following topics: “Korean language”, “Korean studies”, and “Korean language teaching methods”. There were 12 reports delivered during the session. 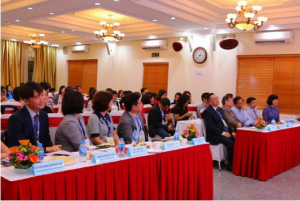 The Conference attracted over 80 representatives participating in. 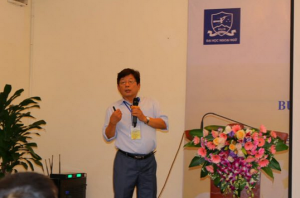 It left an positive impression on how the Conference was organized, its topics.